As you watch the photos scroll on Jaclyn Mayer’s home page, you see the material that inspires her work…the featured design is made of waxed cord and snake chain. 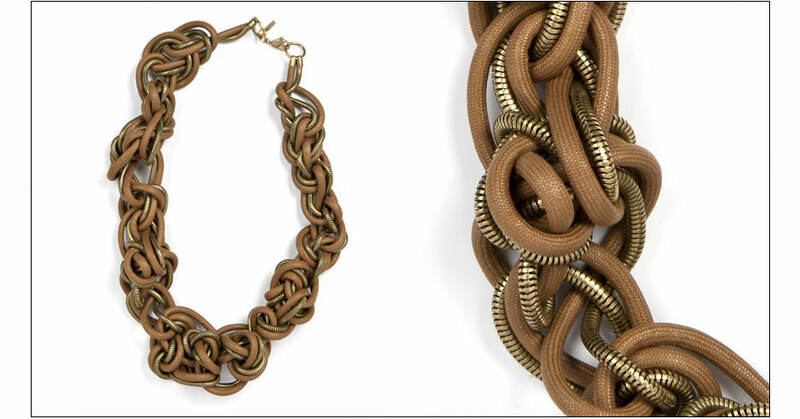 I love the Ashby Necklace (photo #13 in the Fall/Winter 2011)…waxed cord, leather, jersey and ball chain. This is one of those sites that makes you realize…let your imagination fly and…JUST DO IT!!! I really love seeing artists take on a non-precious material and making it look like a million bucks. Her work is gorgeous. Isn’t this great!!! It opens up the mind to a myriad of possibilities. Thank you Jackie. I love my daily treasure hunt!! !